The sailing vessel South Bound II set sail Nov. 6, 1982 from Beaufort, N.C.
On board were Canadian sailing enthusiast Herb Hilgenberg, his wife, Brigitte, and their 6-year-old and 14-year-old daughters. The Hilgenbergs were looking forward to an enjoyable voyage to the Virgin Islands. “The (weather) forecast that we were monitoring … indicated a high pressure system would be moving toward the North Carolina coast and bring settled conditions near shore,” Hilgenberg said. As they sailed toward Cape Lookout, N.C., the winds began to increase and thunderstorm clouds appeared from the east. “The winds were at 25 to 35 knots. We kept listening to North Carolina radio (broadcasts) and they indicated no change to their earlier forecast. We assumed that it was a temporary pattern,” said Hilgenberg. The winds had increased to 40 knots by the second day, and the 39-foot South Bound II was being tossed around by high seas. “We thought hell was breaking loose. My 14-year-old daughter commented ‘it looked like a boiling pot of water out there,’” said Hilgenberg. “The following day, winds ranged between 35 and 60 knots. Seas were, at times, higher than my mast of 45 feet,” said Hilgenberg. Hilgenberg fractured his arm during the height of the storm, but fortunately he and his family survived, arriving in the Virgin Islands on the 10th day of their trip. “We returned to Canada in the fall of 1983 via the Greater Antilles, Bahamas and Florida, after cruising the Leeward and Windward Islands in the Caribbean,” said Hilgenberg. In 1984 they sailed to Bermuda, where they lived for 10 years. Hilgenberg, who earned his Master’s of Business Administration degree from the University of Toronto, worked as an operations manager of a glass company while living in Bermuda. The memory of the November 1982 storm lingered, so Hilgenberg began using a single- side band radio to give weather briefs to mariners crossing the Atlantic because of his family’s ordeal. “It bothered me how little information there was, at the time (1982), on Atlantic weather conditions,” said Hilgenberg. He would contact one or two boats per day, briefing them on weather conditions and forecasts, and also assist the local community with the help of his wife. “Herb became chairman of the ham radio community (in Bermuda), working with the police in case of emergencies, like hurricanes,” Brigitte Hilgenberg said. During hurricanes, the National Hurricane Center in Miami, through the Hurricane Watch Network, an organization comprised of ham radio operators, maintained radio contact with the Hilgenbergs, and they would pass updated information to the community. 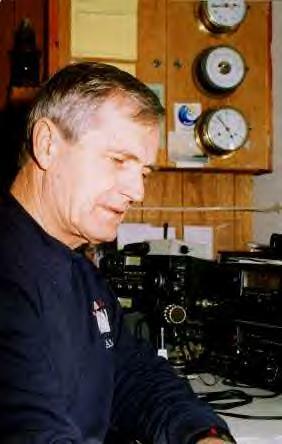 The Hilgenbergs retired in 1994 to Canada where Herb continues to provide weather broadcasts to mariners using his single-side band radio on International Telecommunication Union channel 1253 at a frequency of 12,359.0 megahertz. “For traffic near the eastern seaboard, west of the Gulf Stream, I use ITU channel 851 (at a frequency of) 8,294.0 megahertz,” he said. He is licensed by Industry Canada, the Canadian counterpart to the United States’ Federal Communication Commission, and can give weather briefings to vessels in the Atlantic Ocean, Caribbean Sea, Gulf of Mexico, Mediterranean Sea, the eastern Pacific and as far away as the Black Sea. “I try to give as much of a long-range forecast as possible,” Hilgenberg said. He uses a 150-watt transceiver and two satellite dishes to gather weather information to compile a forecast that coincides with the positions of vessels that are maintaining radio contact with him. His services have grown over the years, and he now communicates with an average of 50 vessels per day, seven days a week, from his home in Burlington, Ontario. “It can peak to 80 in prime season,” he said. Starting at 11 a.m., Eastern Standard Time, Hilgenberg downloads basic weather information and uses that data to compile his forecasts, and plots suggested safe course tracks for the sailing and merchant vessels with which he is communicating. The vessels begin checking in at approximately 4 p.m. (3 p.m. in the winter months), and Hilgenberg spends the next four hours broadcasting his suggested courses, finishing his day at about 8 p.m.
“I’ve worked with weather patterns for many years,” said Hilgenberg. His detailed and accurate forecasts have earned the trust of mariners throughout the world. Hilgenberg not only provides weather information for sailors, but also has assisted the U.S. Coast Guard with search and rescue cases and has become a familiar name to Coast Guard SAR coordinators. “We know him simply as Herb,” said Lt. Heather Waddington, Coast Guard Atlantic Area SAR controller in Portsmouth, Va.
“He has been able to establish communications with vessels when we could not. Many mariners know of him and rely on him for weather broadcasts. He is extremely valuable to us,” said Waddington. That value was evident on Dec. 20, 1994. The 45-foot sailboat Evangeline C departed Bermuda en route to the Virgin Islands with a storm approaching the area, according to Hilgenberg. He advised the owner to make the journey only if Evangeline C could sail 150 miles per day to stay ahead of the storm. The man departed, saying he would be traveling at least 150 miles per day, but only put 80 miles between the Evangeline C and Bermuda after the first day at sea. “(At that point) I suggested he turn around because he was going to run into gale conditions,” said Hilgenberg. But Evangeline C continued on its journey. Dec. 26, the owner of the Tuppence, a 46-foot sailboat sailing off the Bermuda coast, contacted Hilgenberg saying he heard a Pan Pan, a signal indicating an urgent need for assistance, but the signal was weak. Hilgenberg took action and contacted the Evangeline C.
The owner reported a ripped main sail, an inoperable motor, and said he could not steer because of a broken rudder shaft or drive socket, according to Hilgenberg. “I contacted Rescue Coordination Center Bermuda. They said, ‘Call the U.S. Coast Guard’” said Hilgenberg. 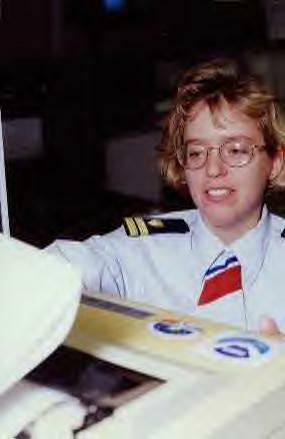 Lt. Heather Waddington, U.S. Coast Guard Atlantic Area SAR controller in the command center in Portsmouth, Va. He contacted Coast Guard RCC Norfolk SAR controllers, who diverted an Argentinean merchant vessel to the foundering sailboat’s location. “(The passengers on board the Evangeline C) had the choice of continuing to drift without steerage or battery power, in rough weather conditions, or abandon ship. When the Argentinean freighter approached that night, they chose to abandon,” Hilgenberg said. “Herb is one of a kind and a tremendous help in solving offshore cases,” said Waddington. May 30, 1997, Hilgenberg was recognized in a letter from Lt. Cmdr. Melissa Wall, Seventh Coast Guard District Chief of Search and Rescue in Miami, Fla., for his efforts in rescuing the sailing vessel Osprey off the coast of South Carolina. He was able to gather information on the distressed Osprey’s location from radio communications relayed through the sailing vessel Ariel. The information assisted RCC Miami to dispatch a Coast Guard C-130 to the location of the Osprey in severe weather conditions. Hilgenberg also established a radio frequency for Coast Guard Group Charleston, S.C., SAR coordinators to stay in contact with the Ariel. The Osprey was eventually towed to safe harbor in the Cape Fear River May 29, 1997, according to Wall. “The professionalism (Hilgenberg) demonstrated is commendable and demonstrates the finest traditions of assisting mariners in distress,” said Wall. And, more recently, Hilgenberg reported to Coast Guard SAR coordinators in Portsmouth, Va., that the 45-foot sailing vessel Victory had sheared its rudder and was experiencing rough sea conditions 258 nautical miles northwest of Bermuda Oct. 29. Victory was in 18-foot seas with wind gusts up to 45 knots. The three people on board reported they were about to abandon ship and had their life raft on deck, according to Lt. Roland Davis, Coast Guard Atlantic Area SAR controller. 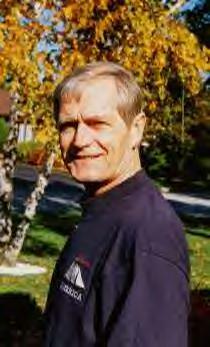 “He gathered all the pertinent information he knew we would need,” said Davis. Hilgenberg relayed the vessel’s identification number for its 406 megahertz Emergency Position Indicating Radio Beacon, name and type of vessel, communications capabilities, and what type of survival gear was on board. All three passengers on board Victory, wearing their life vests, were convinced by Hilgenberg and the Coast Guard SAR controllers not to abandon ship, because it would be easier to find them if they remained on board with their 406 EPIRB engaged, said Davis. A Coast Guard Air Station Elizabeth City, N.C., C-130 crew flew to the scene and maintained radio contact with Victory throughout the night and were relieved by a second C-130 crew Oct. 30, according to Davis. The passengers on board the sailing vessel constructed a make shift rudder and completed their journey to Bermuda Oct. 31 under their own power, according to a Coast Guard report. Hilgenberg provides an invaluable service to sailors and merchant mariners, and is always ready to lend a helping ear to Coast Guard SAR coordinators. He continues to monitor weather conditions around the globe and has learned from his brush with the elements in November 1982, and from assisting other vessels in distress. “Don’t leave a safe port without having a reliable five-day forecast,” said Hilgenberg.